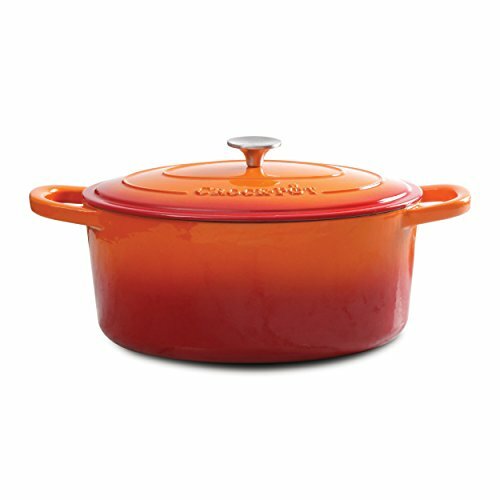 Gibson Home presents the 7-Quart Sunset Orange Artisan Crock-Pot Cast Iron Dutch Oven with a Non-Stick Surface, ideal for delicious dinners for any occasion. The original slow cooker features a self-bating lid which creates a continuous basting environment. The Crock-Pot distributes and retains heat evenly and allows for a multitude of cooking techniques. Generous oversized handles and stainless knobs provide sturdy grip to increase mobility. Cookware works on gas, electric, ceramic, and induction cooktops as well as bake or broil in any convention or conventional oven. Sturdy, rust-free, and easy clean. Hand wash is recommended to keep the integrity of the pot. If you have any questions about this product by Crock-Pot, contact us by completing and submitting the form below. If you are looking for a specif part number, please include it with your message.